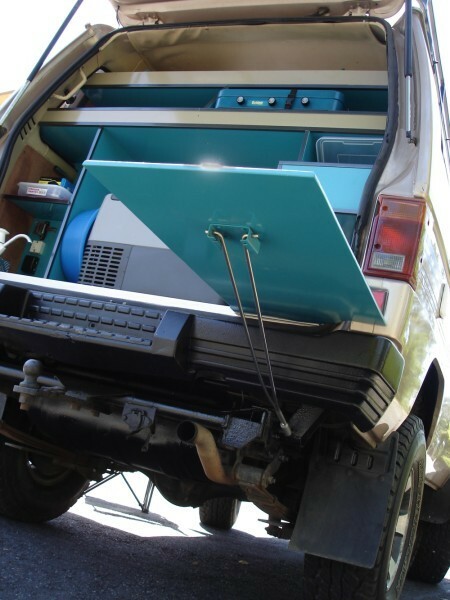 The Running Free series comes always in a cheerful and well-arranged look. 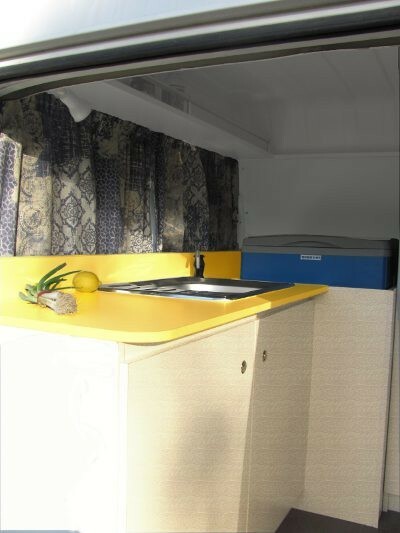 Bright colours given even the smallest space a roomy touch. 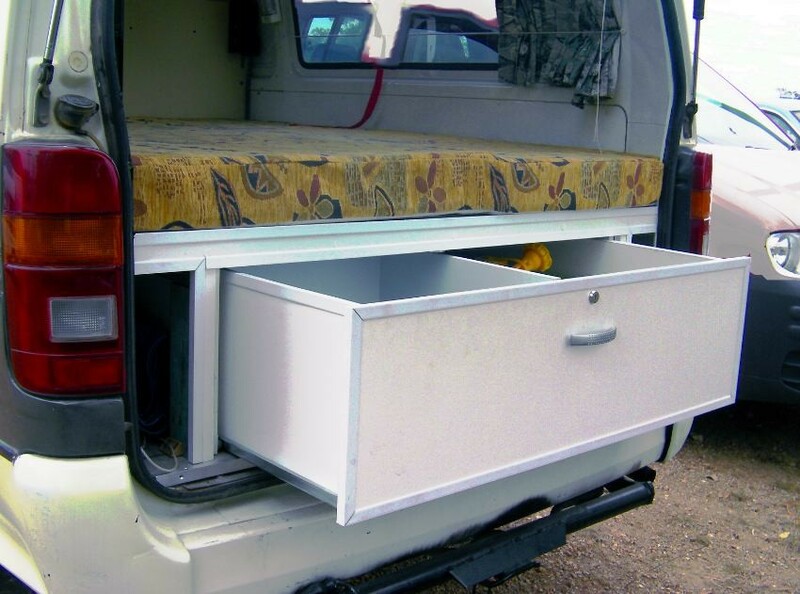 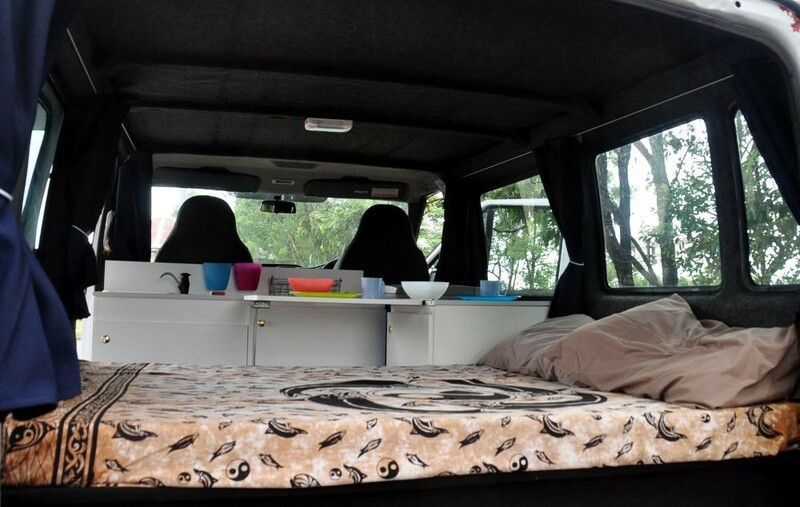 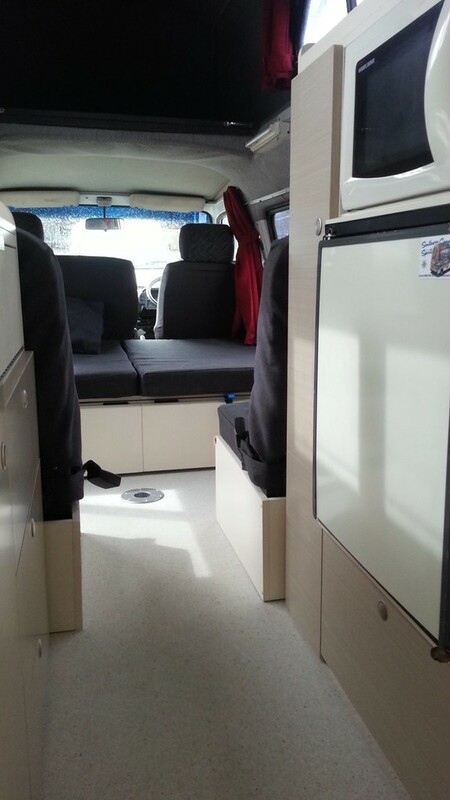 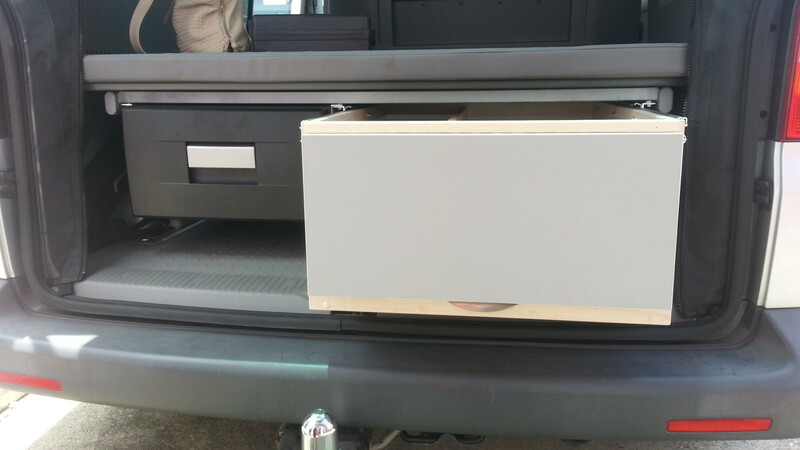 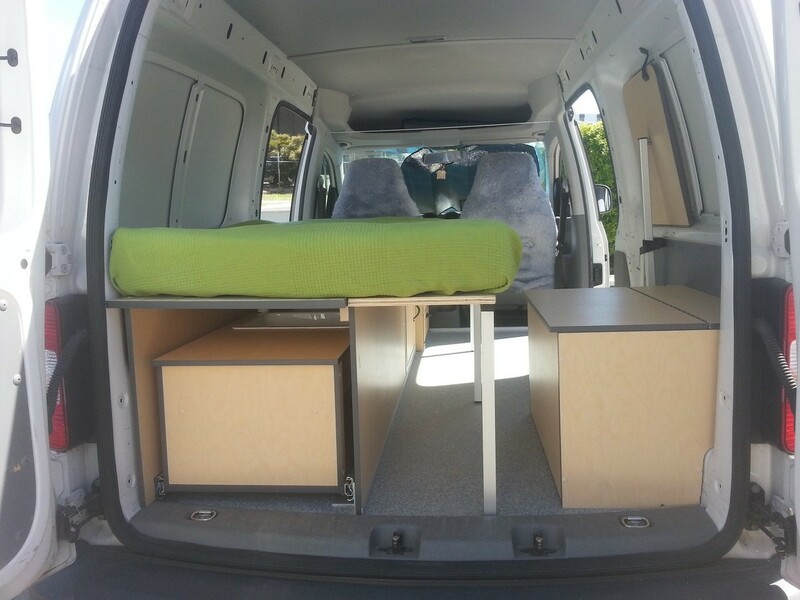 Build on a new floor substrate and furnitures who follow the vehicle inside shapes. 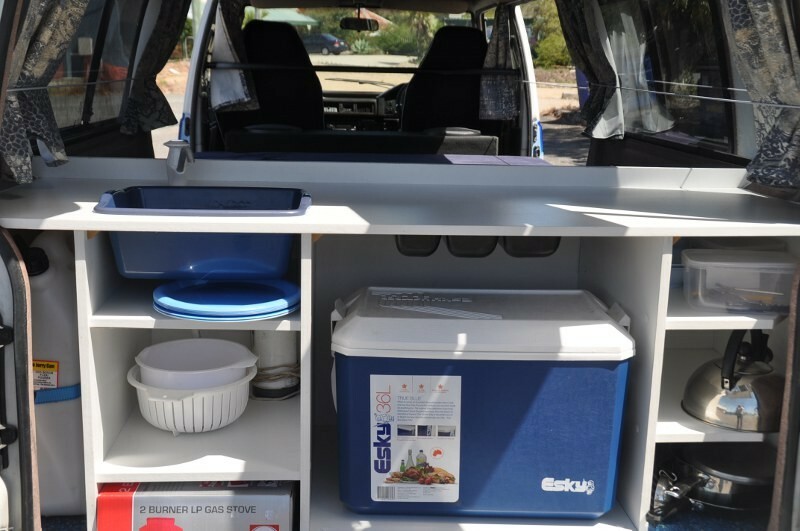 Practical features and smart storage solutions are dominating inside. 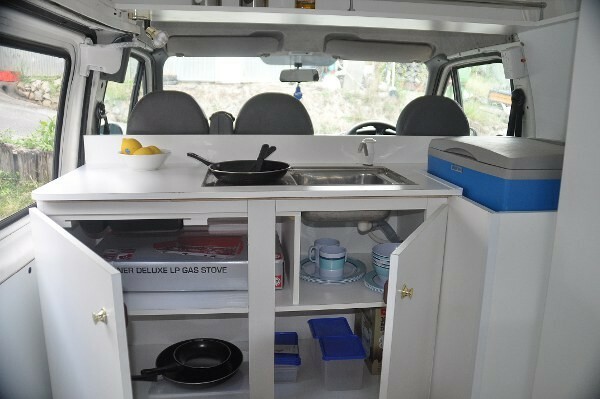 The kitchenette is often inside or combined with a slight out solution with non permanent fitted gas stove and a medium sized water tank. 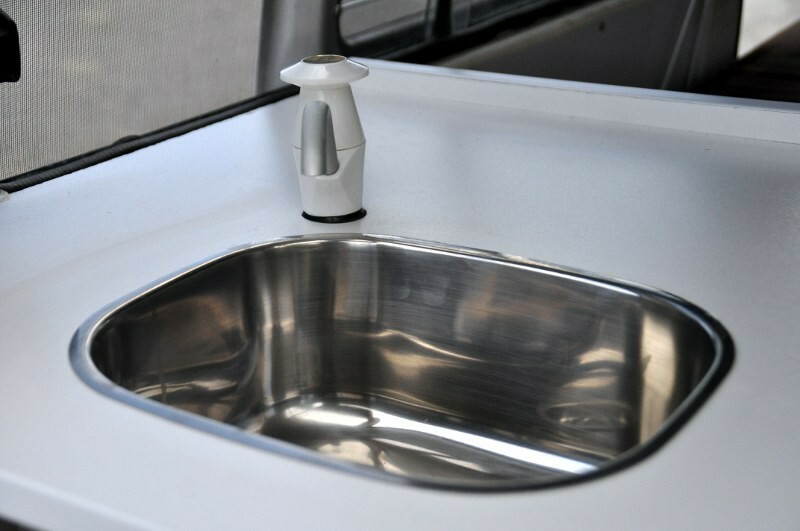 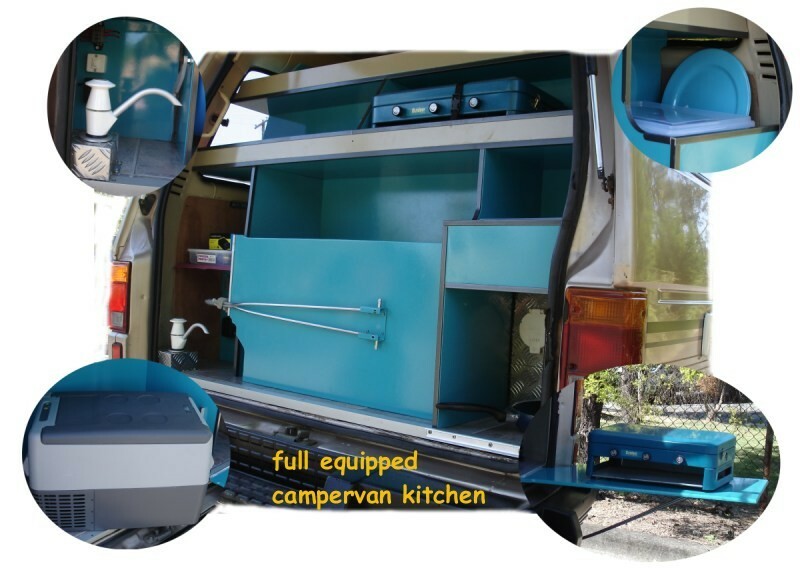 A sink with manual water pump and a top loader fridge making meal preparation easy. 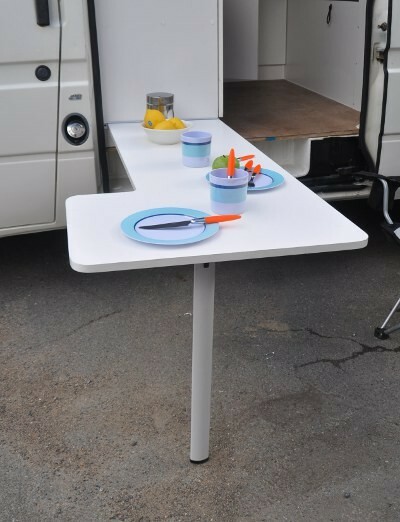 To enjoy your meals outside a slide-on table often completes the series. 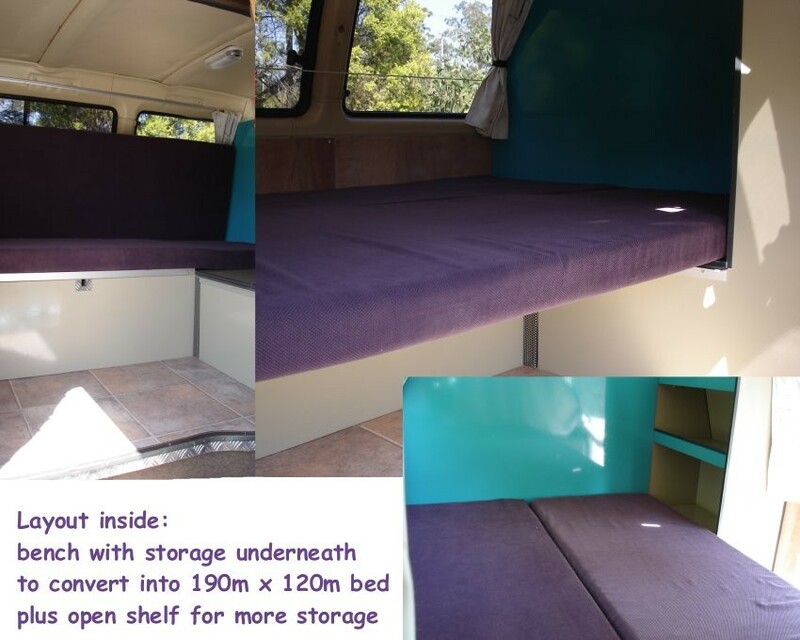 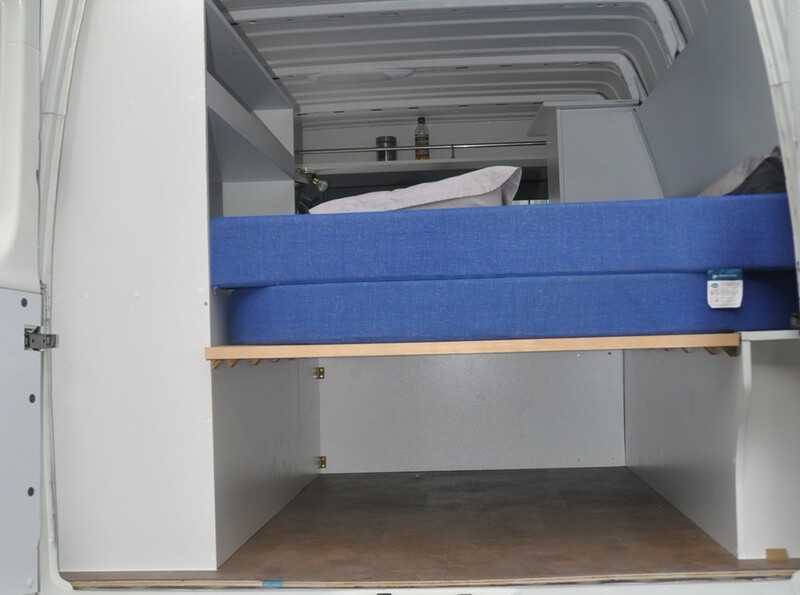 The well sized bed is fitted with standard quality foam mattress and usually permanent set up with lots of storage space underneath. 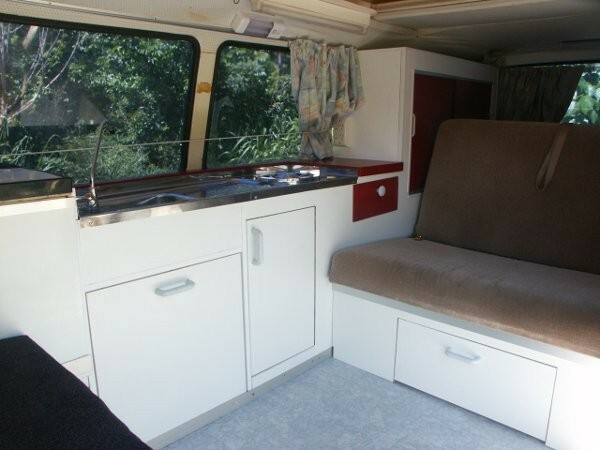 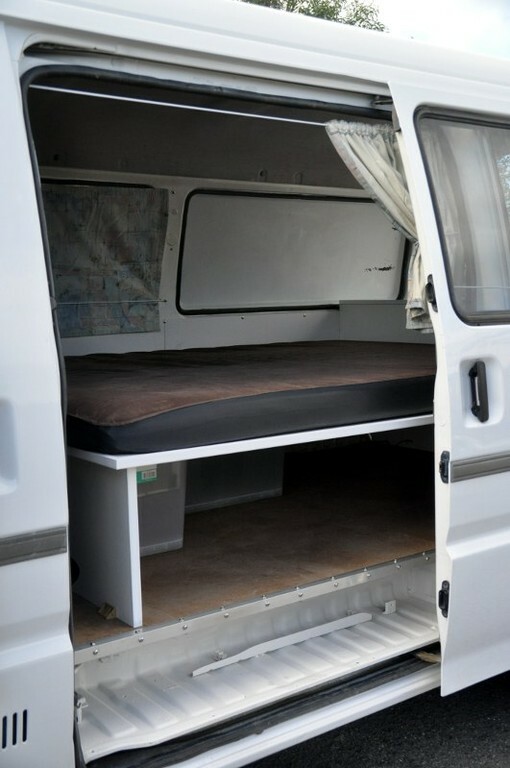 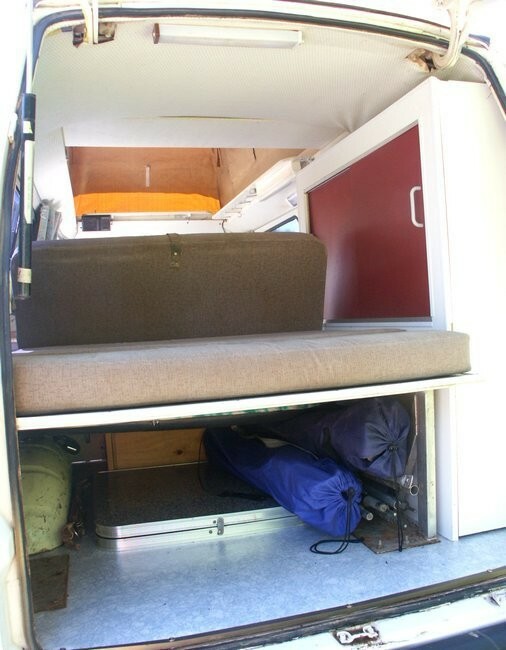 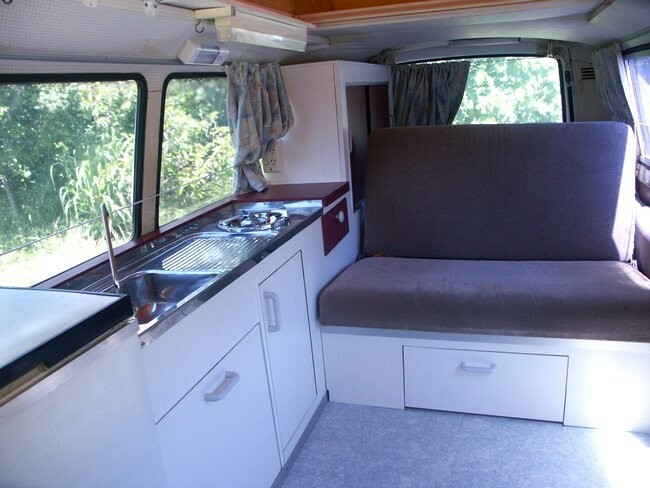 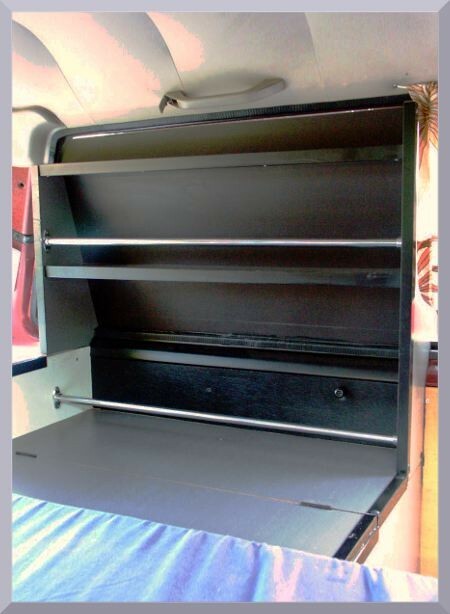 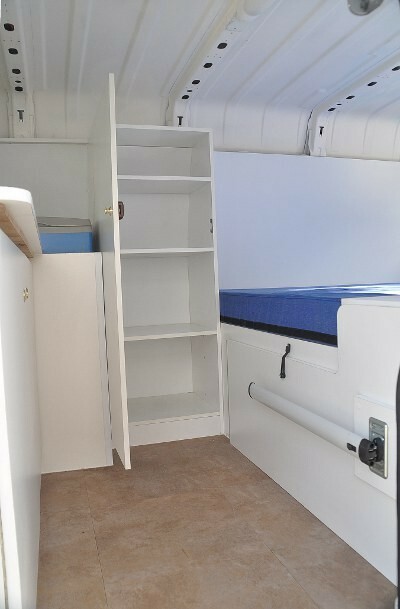 Wardrobe and shelvings are popular modules in our Running Free conversions. 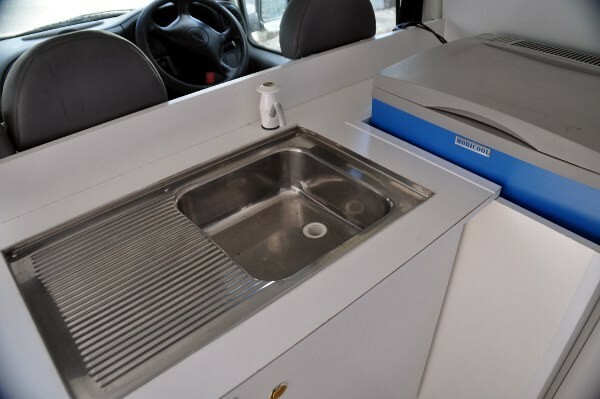 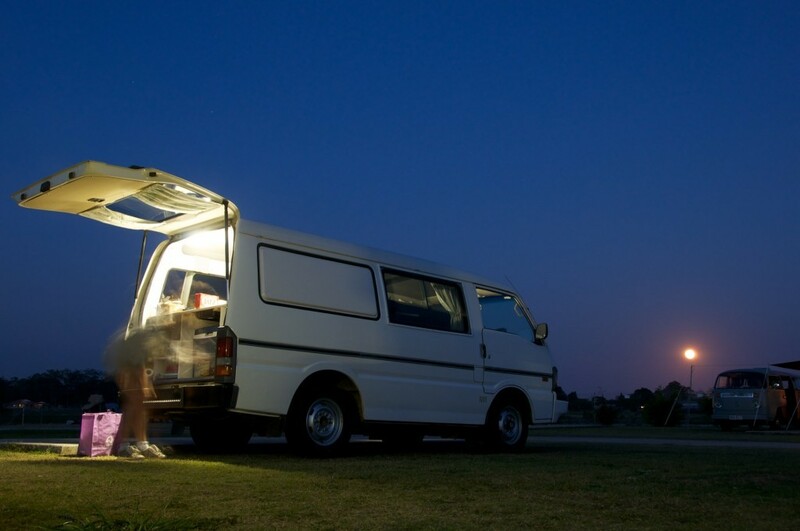 For your every day needs you can find 12V sockets, reading and kitchen lights or 240V power points and often customers getting a second battery system installed. 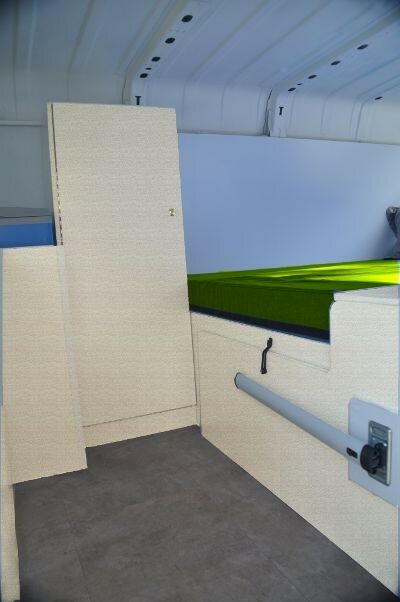 A roof hatch or china hat is fitted for better ventilation, while fly screens keeping the bugs outside and for your privacy block-out curtains are fitted to each window and to seperate driver cabin from the living area. 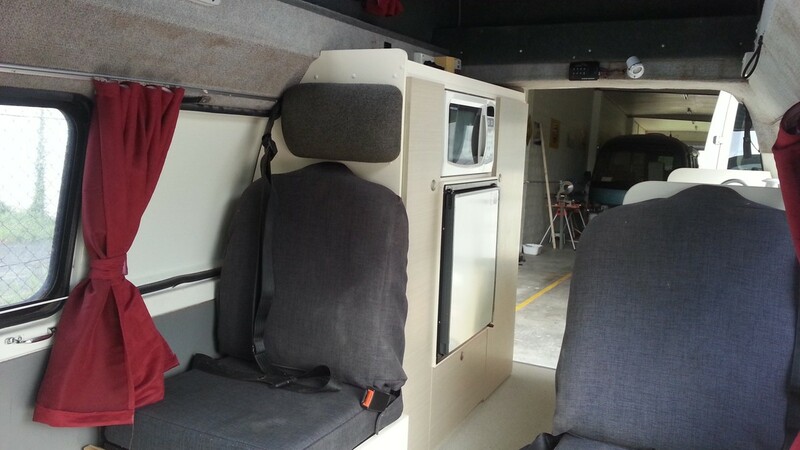 We fit this unit where a focus was on safety and comfort. 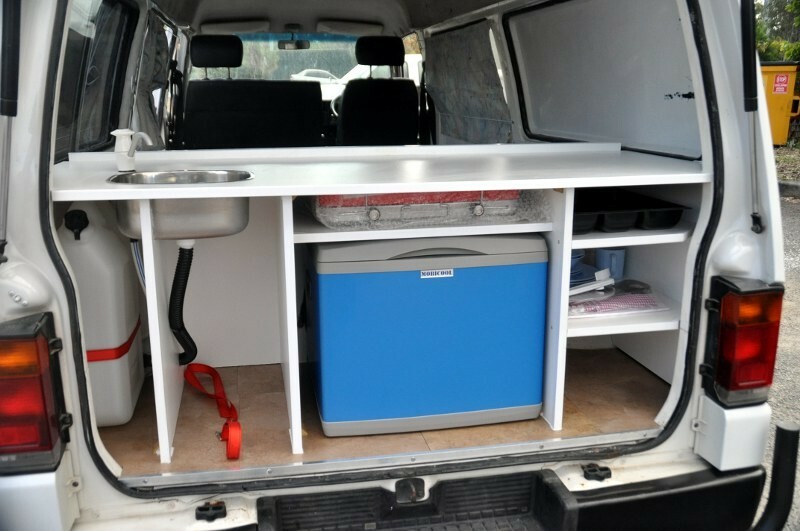 The 2 burner stove runs on alcohol spirits which is extremly safe to use and for installation in all kind of vehicles. 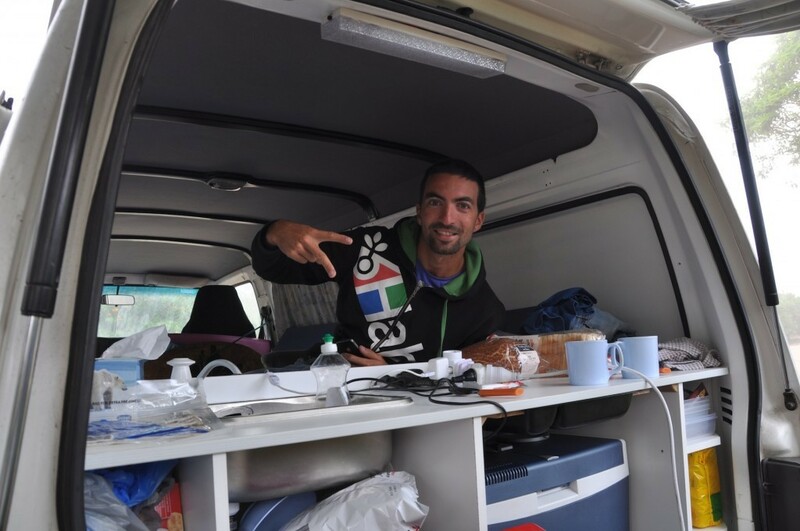 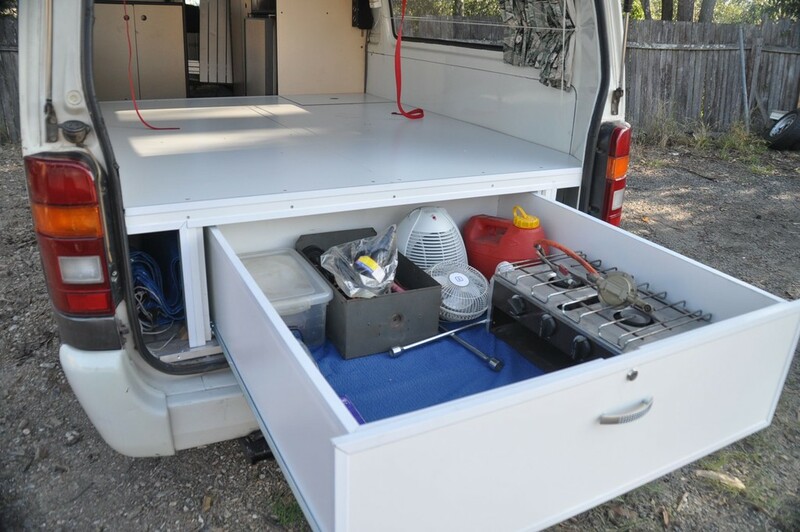 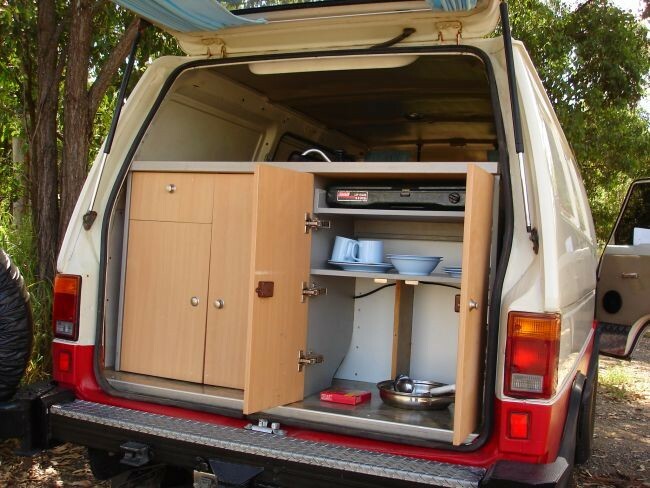 As a clou the stove can be easily taken out of the unit and can be used to cook outside of the campervan. 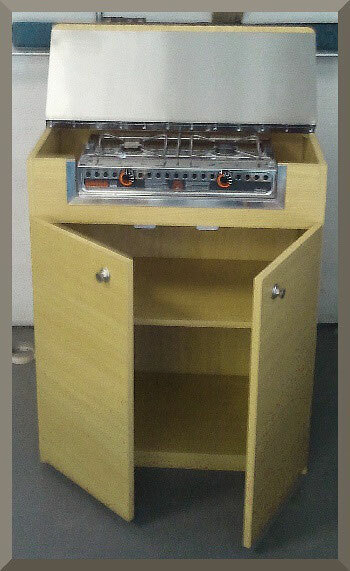 The stove section -with a lid- cladded with heat resistant and easy to clean material. 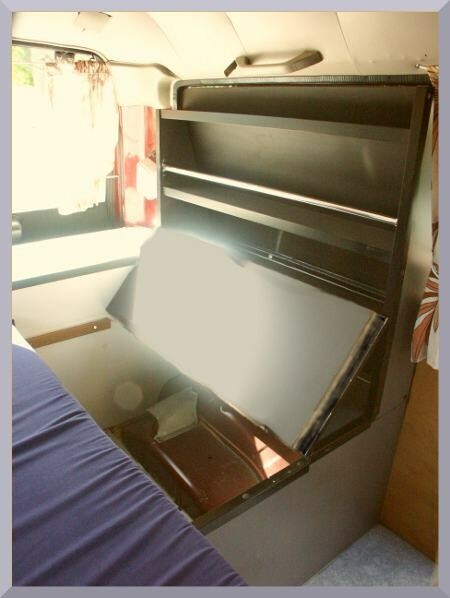 At the stove front the unit has a aluminium framing for protection reasons. 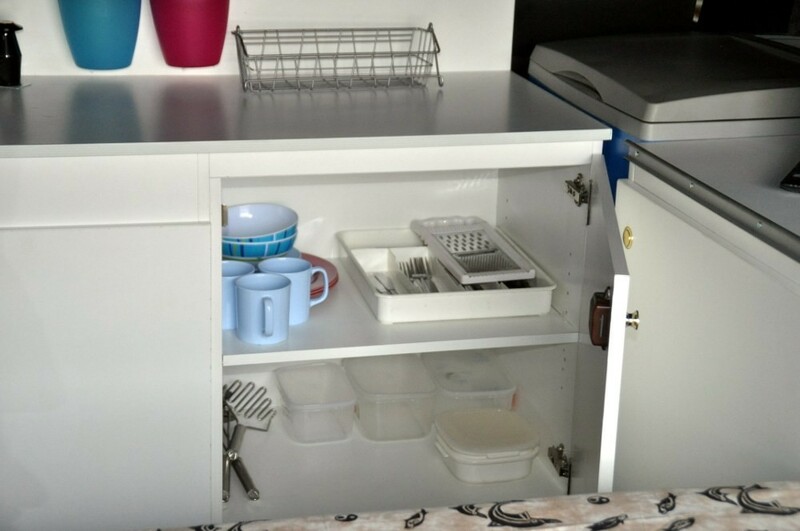 The shelving inside can be set higher or lower and has a "stop-rattling" system. 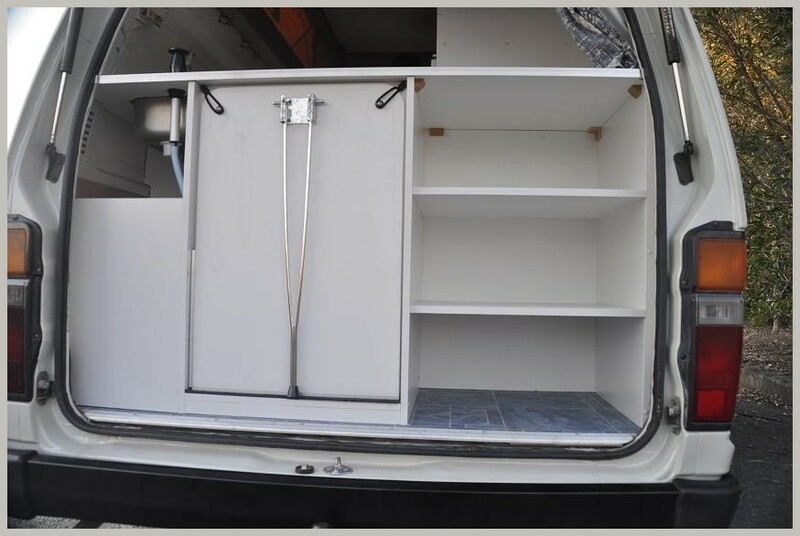 Push looks keeping the doors closed while travelling. 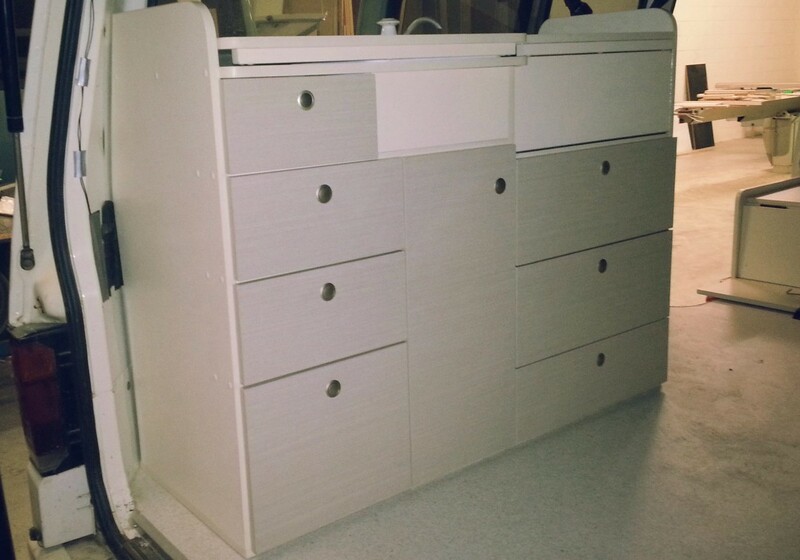 From the outside there a barely any visible screws or screw covers to keep the design tidy. 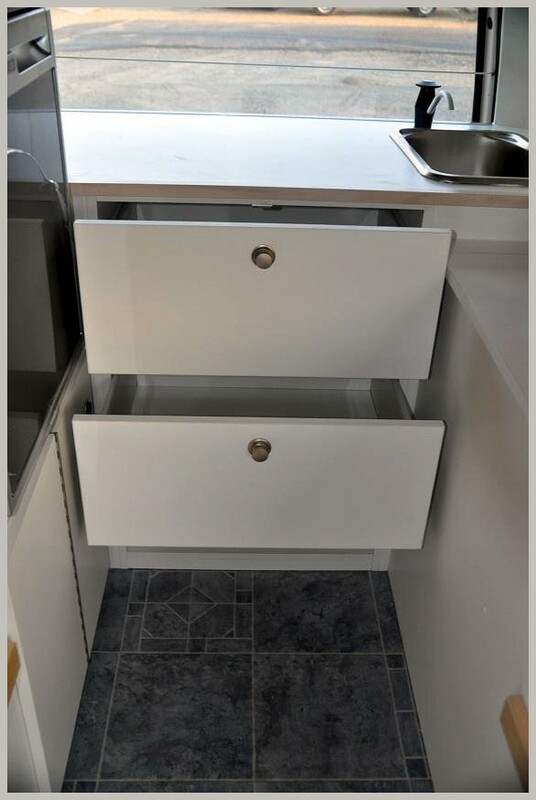 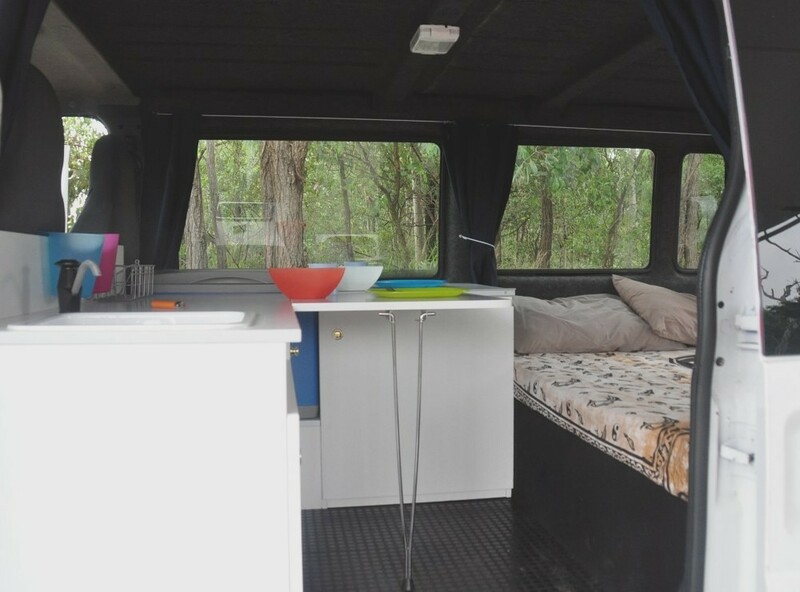 The Running Free Series conversions starting from as little as $6,500 when we create and fit a simple bench, a shelve and storage space and a basic kitchenette. 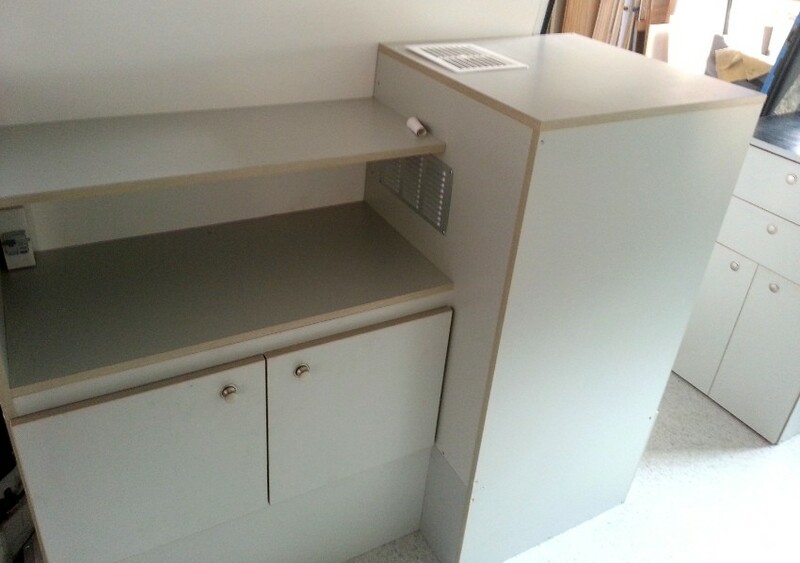 We also do offer part refits e.g. 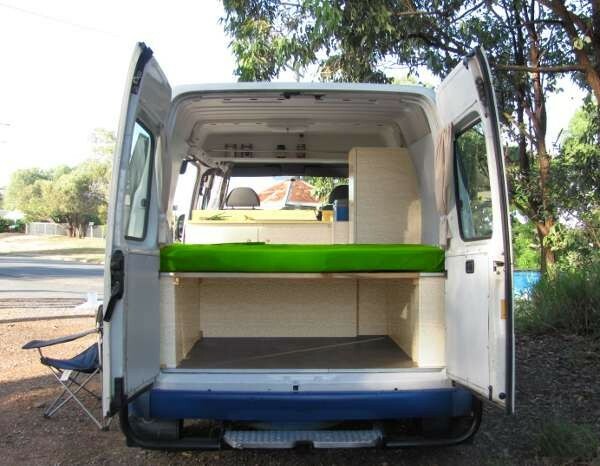 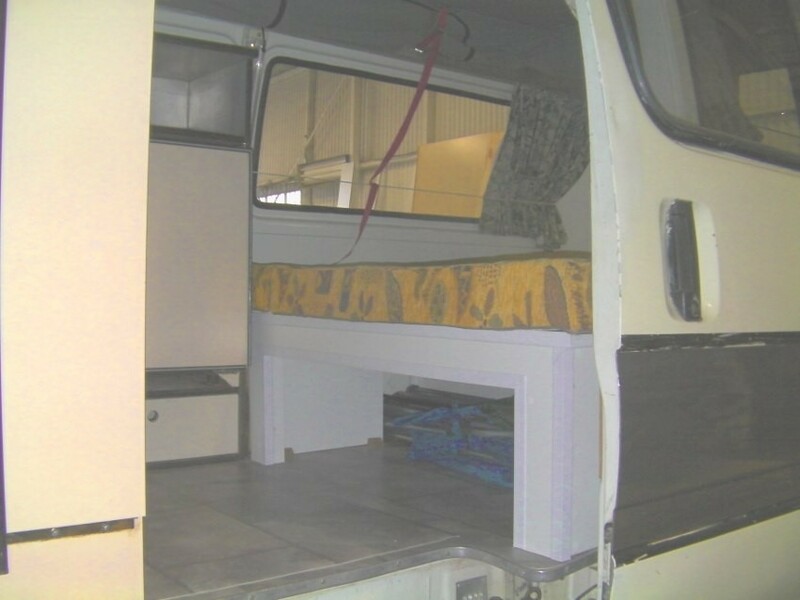 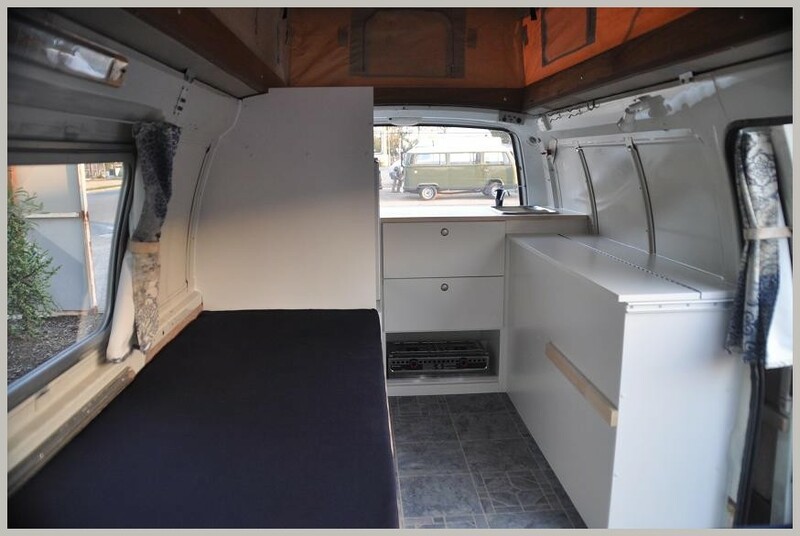 a new bed conversion or see our before & after samples for full & part reburbishments. 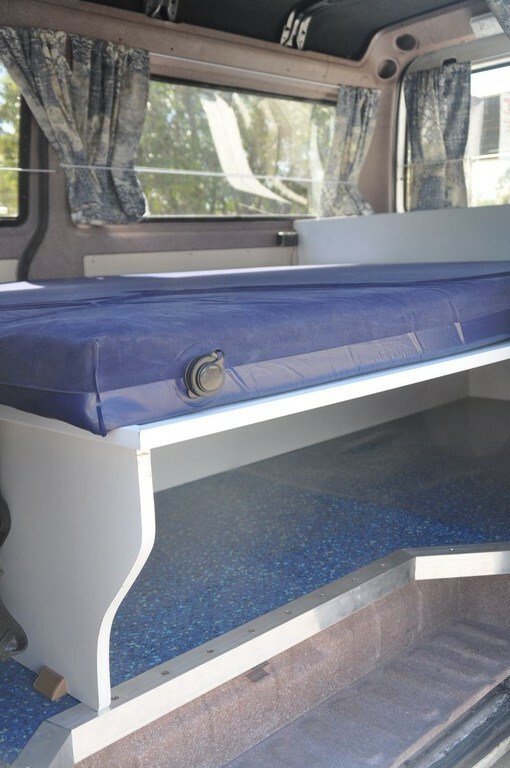 Call us today under 0401 797179 to discuss your ideas with us!